Artificial Eyelashes How to Apply? It is to be seen that eye makeup is very nominal to do. Little variation makes it nice or some times it gets over. Usually, applying artificial eyelashes is considered as an art in which salon experts and makeup artists are good at. It is just because they have a sound technique to apply artificial eyelashes but now inexpert Women can also become an expert in putting false eyelashes application by some easy instructions. It is important to know that there are two kinds of artificial eyelashes which include Full False Eyelashes and Individual False Eyelashes. Within that full false Eyelashes bring colour and thickness to your lash line and these eyelashes are easy to apply and take less time also. Besides that, individual fake lashes are used to fill the light areas of your lash line. For instance, by filling-in these thin areas, you can create an impression of full, wide eyes which gives a more dramatic effect to your eyes. You have to keep in mind that these false eyelashes are quite difficult to apply, so make sure that your hands do not shake. There is another technique that is used to apply artificial eyelashes. 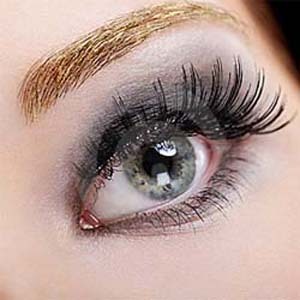 Regarding that, you can trim the width and length of the eyelashes according to your own wishes. You must try out the original length first and then see if you prefer this way or want to cut it. There is another really important thing that should be considered is that Women need to prepare a list of things for false eye lashes applications. For example, a good pair of tweezers, some eyelash glue and your lashes off course. Moreover, A magnify mirror will also be useful for putting false eye lashes. Before applying false eyelashes, line the upper part of your lash line with black eyeliner pencil and smudge it a little to create a smoky effect of eyes. When you are ready, start applying eyelashes. Before the strip ones as they are difficult to apply. Further, pick up the false eyelashes with a pair of tweezers. Now you are likely to have more control if you use tweezers than handle it with your fingers. This technique demands to apply a tiny amount of eyelash glue by dipping the end of the artificial eye lashes. Then Wait for about 30 seconds for the glue to become sticky. You should remember this tip that apply the fake eyelashes on your eyes very slightly and position them as close to your lash line as possible. Now, gently press the eyelash area until false eyelashes are set. Remember if you are using individual lashes, start applying from the outside of your eyes inwards. Once the fake eyelashes are set in place, curl them with a good eyelash curler, together with your natural lashes. Finally, apply some mascara afterwards. And last but not the least; if you are thinking of using permanent false eyelashes, they usually last for two to three months, with touch-ups needed every two or three weeks.